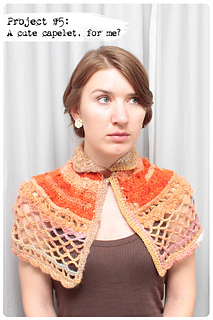 A quick, cute capelet you can make with just one skein. Easy stitches and construction, but this is my first pattern so bear with me. It’s untested, so it’s probably best that you have an intermediate knowledge of crochet so you can adjust to your own gauge/measurements and make other adjustments in your work where necessary. I will update it when I have time. You may have a copy of the PDF that uses the acronym “tlo = top loop only,” I meant “flo = front loop only” and updated the PDF since.